Warranty 3 months against manufacturer defects. For metal casing printers, it is prone to produce interference via connecting Controller with cable. MKS BASE2 solves this problem by integrating the SD card slot directly on the Controller, perfect anti-interference and excellent stability. MKS BASE2 Uses 8825 instead of 4982, which can support 32 and 16 microsteps. SD card slot on LCD 12864 or 2004 will be not available. In order to further reduce the interference, MKS BASE2 increases large filter capacitance on power section. Other functions are exactly the same with MKS - BASE. 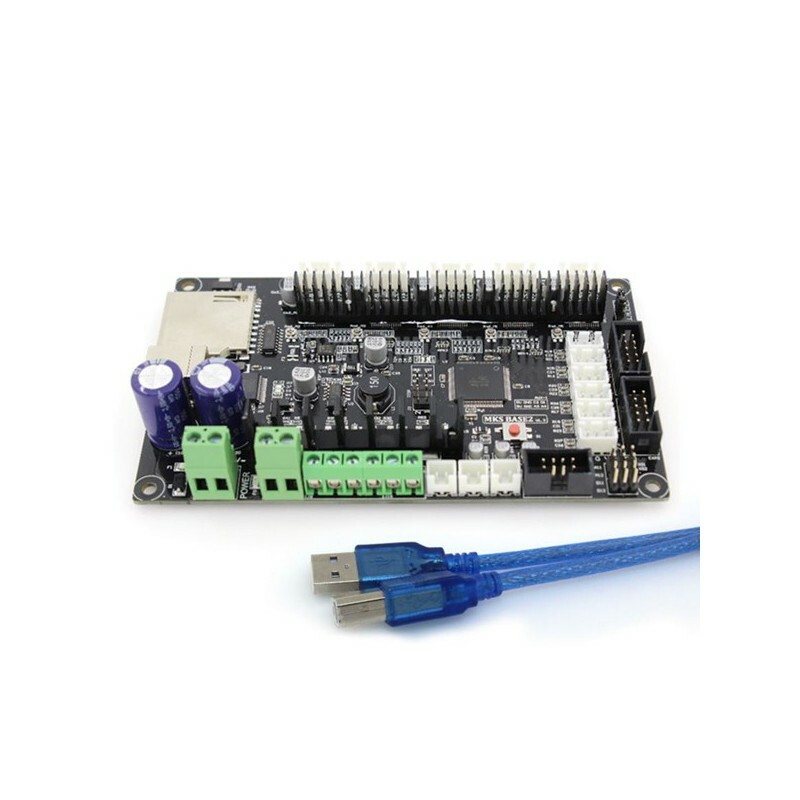 All functions integrate in one board that simplifies combination of interfaces on Ramps1.4 and solves failure-prone problem. Use 8825 as motor drive, pack in SOP . Can be directly connected Ramps1.4, 2004LCD control panel and 12864LCD control panel. Firmware can use the same configuration as ramps1.4 . Software required: FTDI USB drivers, Arduino IDE, Choice of firmware ( Marlin or Repetier or Sprinter ), Pronterface. 1. USB VCP Drivers - MKS Base uses the newer FT232 USB to UART chip and it needs the updated VCP(virtual com port) drivers from the manufacturer's website. Download the correct version for your operating system or you can get the executable version for Windows(easier). Windows Vista/7 may try to do an update to locate the proper drivers but it is recommended to install the FTDI drivers for better performance. The VCP drivers will install a COM Port on your computer for the MKS Base, you can check what port number was assigned by going to your device manager and click on Ports(COM & LPT) look for something that says "USB Serial Port(COM3)" where COM3 is you assigned port number(will vary from PC to PC). Remember this number as you will be using it later in configuring other software. 4. Upload firmware - Run the Arduino IDE (arduino.exe). Select your board - Click on Tools -->Board -->Arduino Mega 2560, Select your serial port - Click on Tools-->Serial Port-->(select your COM port for the X3 USB, you can check this in Device manager). On Arduino click File-->Open -- then point to your Marlin Download and select Marlin.pde. With Marlin loaded on the IDE window, click on the tab that says "configuration.h". These are the basic entries that you need to change to get the it working. 5. Upload(or compile to test) Marlin - While still on the Arduino window Click on the Triangle inside the circle to do a test compile, this makes sure that the firmware does not contain errors( you can skip this). Click on the arrow pointing to the right inside a square frame to upload firmware to the board. If everything goes well you'll see a "Done Uploading" message near the bottom of the Arduino window and you are ready to go.